In 1884, Nathaniel Whiting patented the first grease interceptor design. These oversized, concrete boxes are still the default choice for many in the foodservice industry. Though innovative at the time, the design of these concrete interceptors has changed very little over the past 130 years and is fraught with problems in today’s world. Traditional concrete interceptors range in size from 300 or so gallons to several thousand. Though there are a few different designs, they all rely on the same principle — gravity. Wastewater from a commercial kitchen flows down through the tank, where food particles sink to the bottom and oil rises to the top. The grease-free water in the middle then exits the tank and enters the public sewage lines. Because the middle layer of water is what exits the tank, installing a properly sized interceptor is of the utmost importance. If an interceptor is too large for the amount of incoming wastewater, the grease and food particles will disintegrate and mix with the clean water in the tank during the retention period. Clogs in the sewer line are a likely result. An interceptor that’s too small? You’re looking at the extreme likelihood of an overflow. The difficulty of properly sizing an interceptor isn’t the only drawback of this antiquated technology. There are numerous other issues. When you think of concrete, you might think of a material that’s structurally sound for decades, right? Well, the fact is that concrete interceptors don’t hold up. In fact, some need to be replaced as often as every 5-10 years. And replacement isn’t cheap. First, the existing interceptor needs to be excavated and removed. Once the old unit is out of the ground, a fair amount of cleanup and remediation needs to be done to counter any environmental damage that may have occurred due to leaks or overflows from the old unit. Once the ground is prepared, the new interceptor may be installed. The interceptor must be buried and paved over again. By the time the replacement is completed, the cost can run into tens of thousands of dollars. You might be wondering why the concrete interceptors don’t last longer than a few years. Concrete is actually very susceptible to corrosion and cracking due to factors in its natural environment. Consider the ground in a moist environment, for instance. Each winter it freezes and expands, then thaws and contracts in the springtime. Imagine what this year-after-year freeze-thaw pattern does to the concrete interceptor in the ground! It results in cracking and deterioration of the concrete — just like potholes in a roadway. It’s not just the weather that takes a toll on the interceptor — the grease does a good job of corroding the inside as well. The shape of these traps provides the ideal, stagnant environment for bacteria. Fats, food particles and microorganisms settle down in the corners and invade the porous walls. As the particles rot and the bacteria breed, they release hydrogen sulfide (H2S) gas, which makes the water in the tank more acidic. That further corrodes and degrades the concrete. To make matters worse, the corrosion doesn’t stop there. Once the bacteria begin to breed, it’s a feeding frenzy. They’ll escape from the trap and into the sewage and plumbing lines, leaving a trail of deterioration in their wake. The rebar framework that provides the structure for the interceptor walls isn’t safe, either. Once the top layers of concrete are corroded away from the walls, exposing the metal bars, it’s only a matter of time before the acidic moisture renders the metal useless. It’s important to remember that grease traps are not wastewater treatment devices. If not regularly pumped, the food service establishment runs the risk of releasing waste into the public sewage lines or overflowing the trap — or both. Either way, hefty fines and costly repairs result. The industry standard is the 25 percent rule — commercial kitchen operators should have their interceptors pumped when the interceptor reaches 25 percent capacity or every 90 days, whichever comes first. That means that the food service establishment owner is dishing out hundreds of dollars every few weeks to have the interceptor pumped; it adds up quickly. Some concrete interceptor advocates say to install a larger interceptor to save money on maintenance costs. The fact is, though, the food service establishment will pay for waiting in the long run because the FOG and food solids layers will become quite thick over time, increasing the workload on the grease waste hauler. In the case of very large interceptors, there’s a possibility a pump truck may require more than one trip to properly empty it. And the longer you wait, the more risk there is of the layers mixing and grease escaping into the sewer lines. If not properly maintained, traditional concrete interceptors can pose pretty serious health risks to the immediate community. First, consider what could result from the likely corrosion of the walls. Toxic waste from inside the tank could leach into the surrounding groundwater, potentially contaminating clean water sources. There’s also the nature of the hydrogen sulfide gas that the breeding bacteria inside the tank release. It not only makes the water more acidic, but it is also extremely hazardous to your health. Hydrogen sulfide can, in some circumstances, be fatal. Pump truck drivers, plumbers and other service professionals will typically take special precautions when opening or emptying concrete grease traps to minimize potential exposure to the gas. Not every food service establishment requires an interceptor with a thousand-gallon capacity. Consider a sandwich shop, for instance. If the meats aren’t prepared in-house, the restaurant probably produces very little grease. Even with a “small,” 750-gallon concrete interceptor, the food service operator would need to pump far before it reached capacity to avoid the myriad of problems associated with letting the wastewater sit. A smaller unit, such as one of Thermaco’s Trapzilla models or a Big Dipper unit functioning as a point-source interceptor, would probably work better. Not only are these small units more cost efficient than a big concrete trap that will need to be replaced in a few years, but they provide many more installation options. 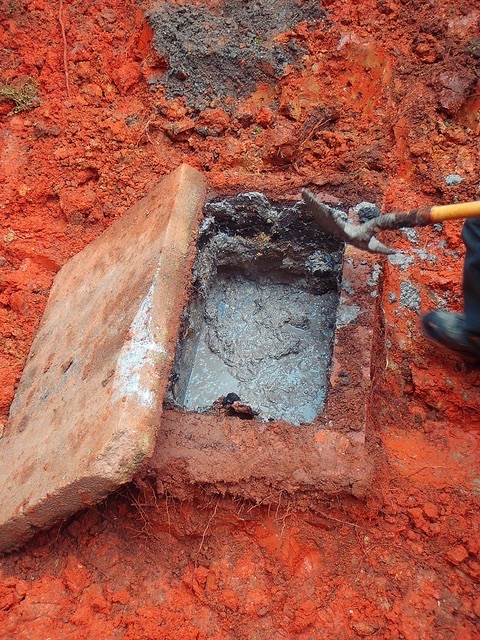 Concrete traps are usually buried outside the building. But smaller, modern grease interceptors can be placed in between floors, in a basement or sometimes even in the kitchen. Big Dipper units are easily emptied and cleaned by restaurant staff, with the waste grease simply being dumped into the trash. With water quality regulations becoming ever more stringent and aging sewer infrastructure a major cost concern, it’s more important than ever that food service establishments stay in compliance with wastewater regulations. Otherwise, regulators will come knocking with fines and other enforcement tools. Your commercial kitchen establishment probably uses modern kitchen appliances — microwave ovens, electric and gas appliances with digital controls, warming lights and more. You don’t depend 19th century technology in your kitchen, why should you accept it in your grease trap? Though Mr. Whiting meant well, it’s time to embrace better technology.